I had to return those self-help books to the library today. I’ve renewed them twice already, which is the limit, and since they came to my branch through interlibrary loan, I’m going to have to request them all again. I did have a chance to skim them, though, and I’ve gleaned a few tidbits. 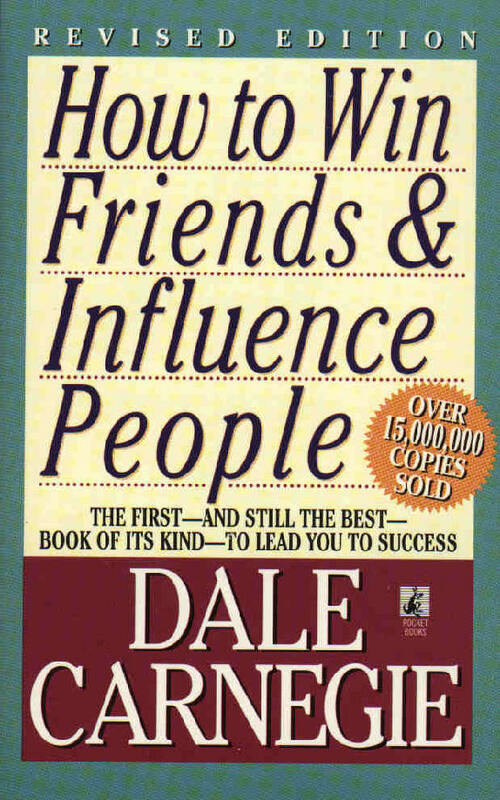 I started with Dale Carnegie’s How to Win Friends and Influence People. It’s a classic. I know this because I’ve heard of it. The first strategy I learned is that Dale Carnegie wants me to read his book twice, skimming the first time. Then I’m to keep it close by me for frequent study, perhaps by my bed. Bedside, huh? Good sales trick. If I need it bedside forever, then borrowing it from the library won’t do. I’ll have to spring for it, nevermind the cost. No indeed, I don’t need to worry, because one of Carnegie’s other books, bound up with this one is How to Stop Worrying and Start Living. I’ve skimmed them both (pat on the back), the latter between 3:30 and 5:30 a.m., so I’m certain I’ve got all the basics now, ready to pass on to you, my tens of readers. Also, assume that people always have two motives for whatever they do, one they will be aware of, and one perhaps less laudible or more self-interested. Always appeal to their nobler instincts. Since I work from home with a sales force of zero, and therefore have only myself to motivate, I’ve been practicing on sales clerks -- and circulation desk librarians. Also on neighbors and aquaintances. I don’t bother with close friends and family – they know the real me. Okay, okay, I’m being glib. The smile thing does make sense. People have told me that when they first met me, they found me a little aloof, or possibly shy. Well, I’m not shy, just reluctant to risk rejection by starting a conversation with someone who doesn’t want it. 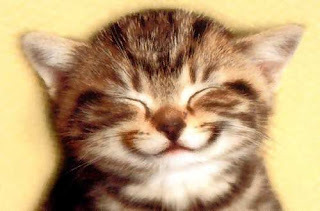 So it makes sense to smile. I agree with Dale. Mr.Carnegie. So I smiled at the receptionist at the optician, complimenting her eye make-up, which had precise swoops of eyeliner and eyeshadow so neatly shaded they looked airbrushed. These compliments, according to Carnegie, must be genuine, and this was. I was genuinely impressed by her precision. I was wearing my usual "natural" look, and given the two decades between us and her poreless, photographic exterior, I felt a bit carbuncular, but I was genuine about her artistry. Next I smiled at the sales assistant, whom she called over to help me. I flapped my new prescription and mumbled that I wanted to try those rimless Silhouette glasses but wasn't sure they were appropriate for extreme myopia and he mumbled that they were probably not the best choice. He spoke very softly, though. Then he fitted me for the rimless frames. He did not repeat his mumblings about them being a poor choice for my prescription. I began believing perhaps I'd misheard him. I really wanted those rimless ones, the kind that look pretty much invisible against your face, but I hesitated. Could they really be okay? With Mr. Carnegie in mind -- the assistant's first motive is to make a sale, even if it means fitting someone with the wrong frames-- I asked him again, holding out my prescription, and he took a look at it for the first time. He shook his head. Not a good choice. So instead of getting annoyed that I was the one who had to bring home this unpleasant point to myself, I just said how disappointed I was. "You don't want to look at anything else?" he said, starting to walk away, sensing that I wasn't likely to be a sale. "I just need a minute to get over it," I said. And then something switched on in the guy. He took my prescription and he went over to his computer and did some calculations and some measurements and he showed me exactly why rimless is not the look for me. Can you say "Coke bottle?" Still thinking of Mr. Carnegie (appeal to the nobler motive), I said I appreciated his honesty. (Hard wrung though it had been.) He had the decency to mumble about not wanting me to buy something I'd be unhappy with. Then we went and picked out a really nice pair of plastic frames. Reading this over, I'm impressed. I effectively used what I learned from Dale Carnegie-- to allow someone else to make me a sale. Interesting. I've had that book on my list for ages, but never read it. The secretary at my office took the course over 40 years ago and still uses it to this day. Everyone loves Kathy - she is so good with people, remembers little things about them, is usually sunny & upbeat - she gives Mr. Carnegie all the credit. Of course, it doesn't hurt that she met her husband of 45 years at the class! Let me know if you are able to keep it up. The advice sounds good but tiring for introverts like me. Thank you! I'm always happy to hear that.